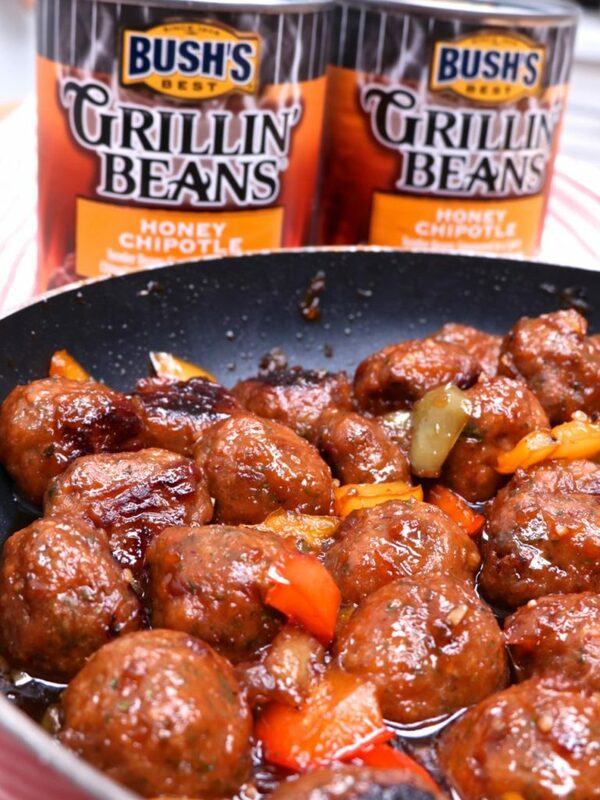 "Tender glazed chicken meatballs with bold, flavorful baked beans baked right in!" It’s that time of year again!! Family LUAU time!!! Every summer I throw a big family luau with TONS of food, festive decorations, island music, tropical drinks- the whole nine! It’s such a fun time, but man is it a lot of work to pull it off! This summer has been so busy that I was so close to postponing it until Fall time but instead decided to keep things intimate with just my immediate family. I’m throwing a midnight luau with delicious appetizers and good conversation at the forefront. I’ve decided to keep the appetizer menu really simple by giving some of my favorite appetizers an island twists! One appetizer that I’m really excited about are these Glazed Baked Bean Chicken Meatballs! 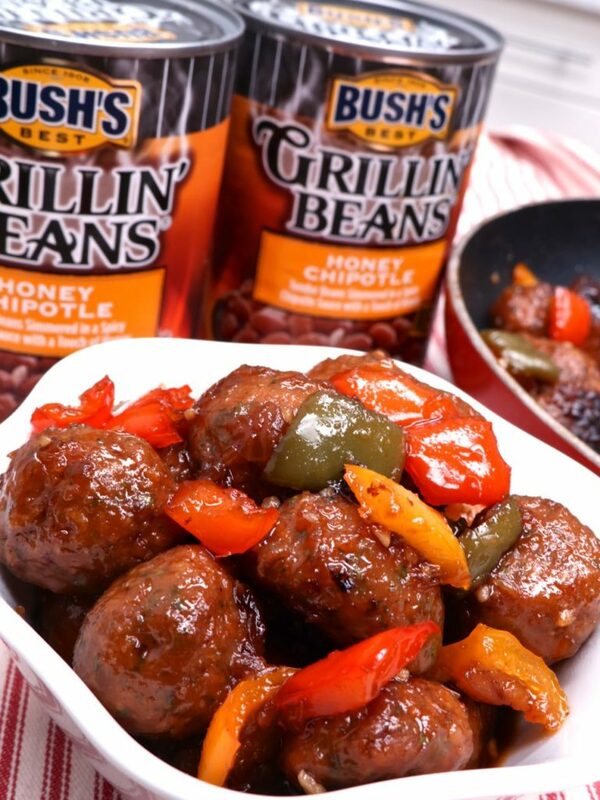 If you like baked beans then you’ll LOVE these meatballs! They really do pack in all the slow-cooked flavors of baked beans in meatball form. A bit spicy, sweet, and smokey! Tossed in a sweet and tangy glaze, these meatballs could be served as an appetizer or as a main meal served over rice in a fresh pineapple bowl! 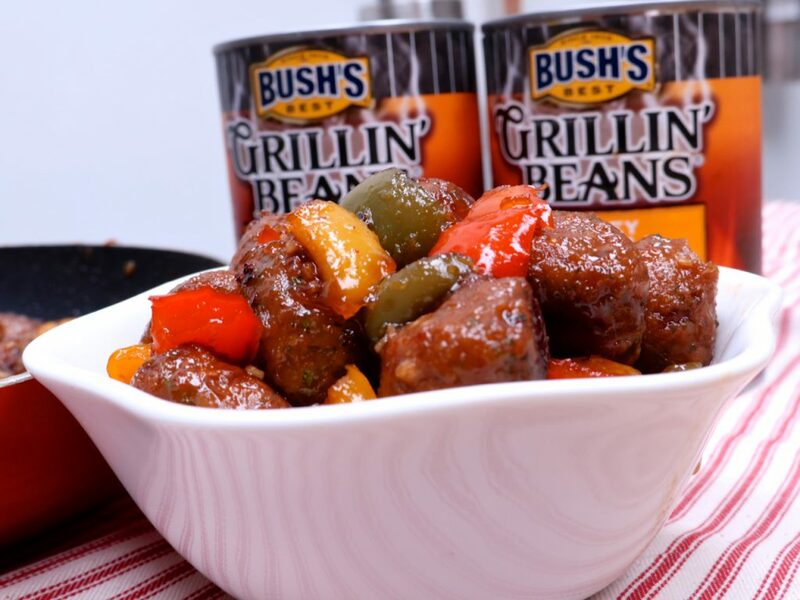 To keep things simple and quick without sacrificing flavor I’m using BUSH’S Baked Beans! Whenever I don’t have time to make a pan of homemade baked beans BUSH’S is what I reach for! It really is the closest thing I’ve found to homemade and those tender beans give the meatballs such an awesome texture! 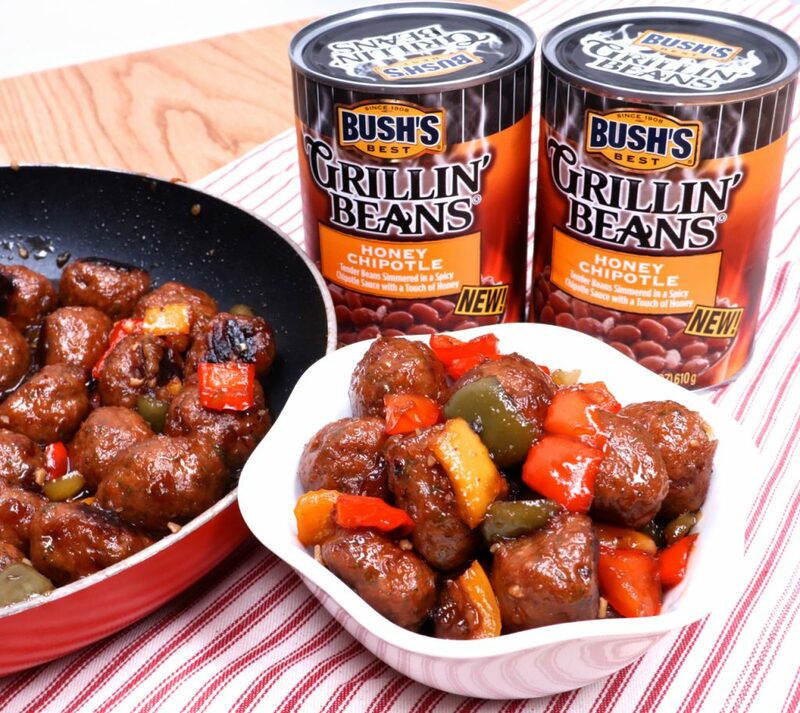 Since BUSH’S Beans are already so full of bold flavor you really can skimp on adding in too many extra seasonings. 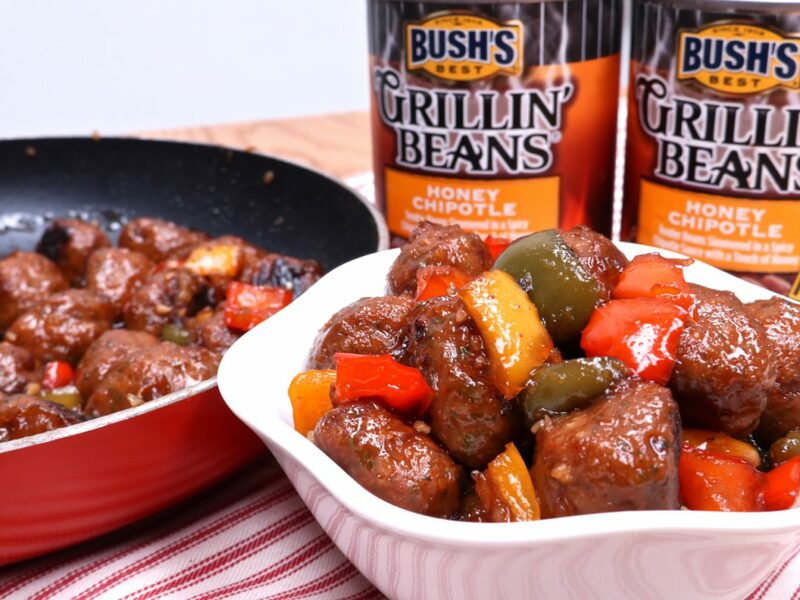 I’m using BUSH’S Honey Chipotle Grillin’ Beans but BUSH’S has over 40 different varieties including Southern Pit BBQ and Steakhouse Recipe which makes it easy to change things up. I’ve already made these glazed baked bean chicken meatballs twice this week and they reheat so well. My husband thinks they would taste amazing wrapped in bacon so that is next on the list! I’ll be using BUSH’S Bourbon & Brown Sugar Grillin’ Beans for that one and I’ll keep you guys posted on how it turns out! What’s your favorite BUSH’S Baked Bean flavor? In a large bowl, mix together all meatball ingredients except olive oil, until well combined. Using wet hands, roll the mixture into even 1½ inch sized balls. Place on prepared baking sheet about 1 inch apart. Bake for 12-14 minutes or until done in the middle, brushing and tossing with olive oil halfway through. Saute' red, green and yellow peppers until tender. Stir in brown sugar, soy sauce, crushed pineapples, cayenne pepper, and paprika. Simmer for about 10 minutes or until sauce has thickened slightly. Remove ¼ cup of the mixture and place in a bowl. Stir cornstarch into the reserved mixture and pour back into the skillet. Continue simmering until sauce has thickened enough to coat the back of a spoon. Add meatballs to skillet and toss to coat. This is a sponsored conversation written by me on behalf of Bush Brothers & Company . The opinions and text are all mine. Ohh wow!!! Yummy! Making it today…. thanks for sharing.??? ?Yummy recipes. Recipe calls for 1/2 cup of honey for the Glaze, but nowhere in the instructions did it say when to add. it’s missing from step 10. I just added, but just a side note that it is missing . Steps #12 & #13 cover this. I almost missed it the first time too. Have you ever used beef??? And where do you find ground chicken??? This recipe should come with a cook! Don’t you have something simpler for a Man without a Good Women,Who Likes Baked Beans? These look awesome!! My husband loves baked beans, too, so I’ll definitely be making these. I was wondering if you leave the beans whole or do you mash them as you mix the meatballs? “LOVE ‘UM”… That was the response I just got from my family & friends. I served it with rice & also had a medley of steamed vegetables too. Thank you so much ‘Lady Diva’ for your gr8 ideas. This looks amazing!!!! Please add on your YouTube channel! I need to see this recipe in action! This looks like a very good recipe and I can wait to try it for my family I know they are going to enjoy it. Can’t wait to try this recipe! You mentioned soy sauce twice on the ingredients list. Is it 1 tablesoon, 1/4 cup, or both?